Abraham Sapien, born Langdon Everett Caul, is a fictional character introduced in the comic book series Hellboy, created by Mike Mignola. He takes his name from "Ichthyo sapien", the fanciful species designation chosen for him by his colleagues in the 19th-century Oannes Club, and from Abraham Lincoln, on whose assassination date the Oannes Club abandoned Abe's body, leaving only a cryptic note as explanation, in a suspended animation tank beneath a Washington D.C. hospital. He is occasionally referred to as an "amphibious man." As well as regular appearances in Hellboy and B.P.R.D., Sapien has also starred in his own comics, with trade paperback collections and omnibus editions including The Drowning, The Devil Does Not Jest and Other Stories, Dark and Terrible and Lost Lives and Other Stories. Sapien began his life as Langdon Everett Caul, a Victorian scientist and businessman who became involved with the Oannes Society, an occult organization who believed in life and all knowledge having come from the sea. After retrieving a strange jellyfish-like deity from an underwater ruin, Caul and the other members performed an arcane ritual that inadvertently ended with the creature's release and Caul being turned into an ichthyo sapien. Believing him to be Oannes reborn, the society sealed the developing icthyo sapien's body in a tube of water in the hidden laboratory beneath a Washington, D.C.. hospital until such time as he was fully formed. Forced to abandon the site by the outbreak of the American Civil War, the Society never found occasion to return for Caul, and there he stayed until he was found by workmen in November 1978. With no memory of his life before, the icthyo sapien received a new name from a piece of paper attached to the tube, dated the day of Abraham Lincoln's assassination (April 14, 1865). Abe Sapien was taken to the Bureau for Paranormal Research and Defense (BPRD) for a grueling round of research by curious BPRD scientists and was saved from vivisection by an empathetic Hellboy. Thereafter, Abe entered the ranks of the BPRD as a valued field agent, embarking on his first mission with Hellboy in 1979. At Cavendish Hall, during the climax of Seed of Destruction, Sapien was possessed by the spirit of long-dead whaler Elihu Cavendish, a contemporary of Langdon Caul who killed the mad monk Rasputin, foiling his plans to unleash the Ogdru Jahad to destroy the world. During the subsequent "Girescu affair" during Wake the Devil, Abe and a fellow agent were led into a trap which left the agent dead and Abe with a broken arm. Rasputin's vengeful spirit appeared before him and prophesied that Sapien will one day be speared to death. In Plague of Frogs, Rasputin's prediction came true when Sapien was impaled by a spear and apparently killed by one of the Ogdru Jahad's followers. Sapien appeared to die and had an out of body experience that brought him to his former life in antebellum America. Witnessing his past self's actions, Abe entered Caul's body prior to his transformation, creating a spiritual/mystical time loop before Abe returned to live in the present, making a fast recovery and began to do research into his past life. As a result, Abe learns of Edith Howard, Langdon Caul's wife, who drowned herself out of madness, becoming a specter that was forced to be exorcized after she attempts to have Sapien resume his life as Caul, leaving Sapien with the memory of a wife he could never know. In Garden of Souls, Sapien was contacted by Panya, an ageless mummy trapped by the Oannes Society, Sapien's compatriots from his former life as Langdon Caul, who were sequestered away on a hidden island in Indonesia, their now-withered psychic forms contained in cyborg bodies. Aware of the imminent apocalypse, the society was determined to save at least some of mankind's spiritual essence, and were poised to use bombs to cause massive tidal waves which would devastate the southern hemisphere, the souls of whose population could then be harvested by the Society in vat-grown bodies made expressly for the purpose, granting them god-like powers. Horrified, Abe managed to single-handedly destroy the society and escape with Panya, and in so doing finally came to terms with the ghosts of his past; he was truly a separate identity from Langdon Caul, who would likely have agreed willingly to the society's plan. Abe has since fully returned to the B.P.R.D. and continues to be one of the most trustworthy agents. However, in King of Fear, Abe led a return mission into the Hyperborean underworld and was confronted by the supervillain the Black Flame, who had gathered a vast army of frogs and Hyperboreans to usher in the apocalypse. The Flame revealed that Abe was going to be the epicenter of this new Earth and that he was a fully evolved version of the frog monsters: one of the New Men first mentioned in Hellboy: Conqueror Worm by Rasputin. While Abe rejected the idea, many of the BPRD field agents are now wary of him, most notably Andrew Devon; in New World, there is visible tension between Devon and Abe implying that Devon thinks Abe should be much more closely monitored. A vision of the future in King of Fear by Liz Sherman showed that, by that time, Abe will have a more monstrous form. Most recently in Gods, Abe was shot by a psychic girl named Fénix, in which the BPRD has shown interest. According to Professor O'Donnell, Fénix is equal to the ancient Hyperborean shamans who keep the Ogdru Hem for entering in Earth after Hyperborea's fall using the Vril energy. Fénix says, before shooting Abe, that she knows who he is, implying that she figured Abe's condition as an evolved form of the frog monsters. Abe is last seen in a helicopter, being treated for his bullet wounds. Devon witnesses the shooting, but lies when asked regarding it later. In Monsters, it's revealed that Abe's condition in the B.P.R.D. headquarters suddenly worsened, and, despite they manage to take him to life support to keep his body alive, he suffered extensive brain damage and the doctors declared him brain dead. However, he miraculously recovered but began mutating further, growing taller, his limbs and neck lengthening and lost his nose, all while comatose. Abe eventually awakened, discovered his transformation, and stumbled into the empty monitor room, to discover the world in apocalypse while he was out. Panya confronted Abe, telling him what happened and that Hellboy has died. Taking Panya's advice, Abe fled the B.P.R.D., stealing a truck, to go out on his own and discover if he is involved in the apocalypse. Kate Corrigan, highly desiring her friend's return, sends agents to bring him home but eventually give in due to more pressing matters. Amphibious physiology: Abe can breathe underwater and swim at a great speed. Excellent marksman and hand-to-hand combatant. Possibly immortal: Abe is exactly 220 years old and technically died twice only to come back to life, also survived numerous wounds that would be fatal to humans. With his second transformation to his current form, Abe's strength, agility, and speed has significantly increased, performing feats never seen before by him. His speed is at its peak underwater. Lately, by his own admission, Abe has been having an intuition of danger, always knowing something bad is going on before it happens with little to no proof. In the films, he displays a genius-level intelligence, and has psychic intuition, making him adept at telepathy and psychometry. However, his strength is not increased, while he has superhuman speed underwater. He is also capable of surviving wounds that would be fatal to humans. Abe Sapien had an internal numbering on the inside cover from its second issue onwards. When the series became an ongoing series in 2013, an ongoing numbering was present on the cover, which reset back 1. However, the internal numbering is still present on the inside cover. In the 2004 film adaptation, Hellboy, Sapien is portrayed by Doug Jones, and voiced by an uncredited David Hyde Pierce who refused credit out of respect for Jones's performance. In the movie, Sapien is psychic, and has psychometric abilities. Sapien's genetic makeup gives him the power of ultra-sentience found in the most mysterious and intelligent underwater creatures. With a frontal lobe resembling that of a dolphin, Abe is able to transmit and receive electro-psychic information in the same way that cetaceans use sonar. Sapien has an encyclopedic knowledge of the occult and holds paranormal expertise rivaled only by Professor Bruttenholm. He is also nicknamed "Blue" along with Hellboy, who is "Red". Unlike the comic version, Sapien is unable to survive indefinitely out of the water for long periods without a collar-like apparatus that provides water to his gills. This version of Sapien enjoys eating rotten eggs. He spends much of his time reading four books simultaneously through the large water aquarium (in which he lives, located in Professor Bruttenholm's office). He is attempting to solve a Rubik's Cube, stating it has been three decades and he has only completed two sides. Sapien appeared in the film's 2008 sequel, Hellboy II: The Golden Army, in which he was played by Doug Jones who provides his speaking parts. He doesn't wear his breathing apparatus as much in this film, and he shows his marksman skills in the film. He is also the one who discovers Liz's pregnancy in the mission where Hellboy is revealed to the world. He falls in love with the elf Princess Nuala, which leads to his helping Prince Nuada by giving him the magical crown piece (to control the Golden Army) for her safety, but Princess Nuala kills herself to prevent Nuada from killing Hellboy. In the 2019 reboot film Hellboy, Abe appears on the final scene of the film having been discovered by Hellboy, Alice and Daimio inside his stasis tank which is located on a secret facility in the middle of Siberia. 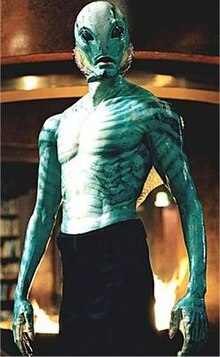 Abe Sapien is one of the characters appearing in two straight-to-DVD Hellboy Animated films, Hellboy: Sword of Storms and Hellboy: Blood and Iron, in which he is voiced by Doug Jones. This version of the character, although similar to the movie Sapien, is much more like his comic book counterpart, showing signs of neither the psychic abilities nor breathing apparatus. However, he is far faster, more agile and stronger than humans in the films, allowing him to fight giant creatures that only Hellboy is thought to be strong enough to fight. Abe is a playable character in Hellboy: The Science of Evil. ^ "Talkin' Abe Sapien with Scott Allie". Interview. Mignolaversity. Retrieved 3 March 2013. ^ Glendening, Daniel. 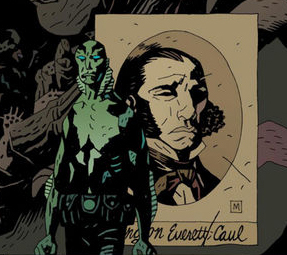 "Allie & Oeming Ask if "Abe Sapien" is Messiah or Monster". Comic Book Resources. Retrieved 22 August 2013. ^ "Doug Jones interview". Horror.com. Archived from the original on 12 May 2007. Retrieved 2007-06-03. he was quoted as saying, "That was Doug's character and I wanted to leave it that way"